It's been a long time coming, but here's Hitori version 0.2! Hitori now depends on GTK+ >= 2.13, so it may not be easily compilable on some distributions, which is an unfortunate side-effect of using the new gtk_show_uri function. As before, please contact me to report bugs. I don't really have any plans to extend the program any further, but if anybody has any ideas, I'm open to them. This entry was posted in Projects and tagged Hitori, icon, Tango on June 27, 2008 by Philip Withnall. It's announcement time! I'd like to announce a little game I've been working on for a week or so (on and off), written because I found this amazing puzzle in a newspaper called Hitori. 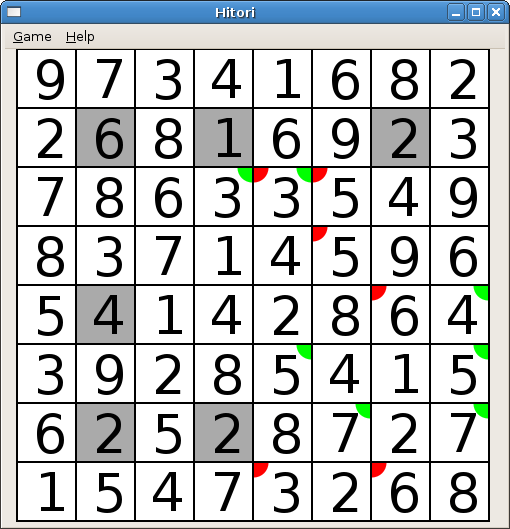 Hitori is quite similar in style to Sudoku; probably because both are published by Nikoli. The objective is to remove cells from the grid so that only one of each digit remains in each column and row. However, you can't shade two touching cells, and all the unshaded cells must be connected. I wrote an application to let you play Hitori on the computer, called – funnily enough – Hitori. At the moment, it supports board generation (algorithm courtesy of a mathematical friend of mine), full validation of solutions against the three rules, hint support, undo/redo, and two different ways of "tagging" cells as you work out the puzzle, to make it a little easier. I've updated the commands to reflect the fact that the repository needs tag support. A shiny icon, if somebody could help me out with it! Support for different board sizes. Looking into themeable colours (or at least making sure the way they're done is HIG-compliant, because at the moment the RGB values are hardcoded). That's it! If you've got any feedback, comment below, or contact me. This entry was posted in GNOME and tagged Hitori on September 13, 2007 by Philip Withnall.